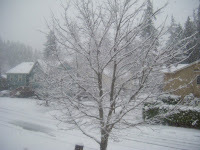 Snow in March in Seattle? You bet. 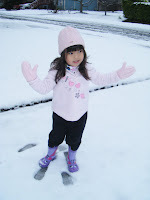 I couldn't believe it when Lexie and I woke up this morning and she said "look Mommy, snow!" 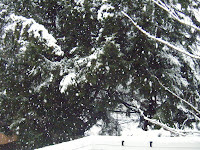 And we are talking SNOW not just a little but big huge heavy flakes. 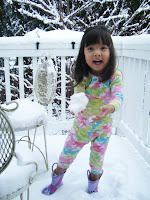 At first I let her just go out on the deck in her boots (thank you Brooke) and jammies. 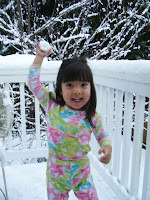 But it quickly became clear that we needed to bundle up and go out front, especially when she decided to throw snowballs at me while I was still in the house taking these pictures! By the time we got dress up to go out it had stopped snowing and within 5 minutes of being outside it had started to rain. After all we are in the Pacific Northwest. So Lexie and I built the quickest snowlady every. 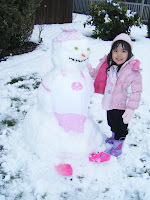 And here she is Princess SnowLady. We were soaked within 15 minutes of going outside but Lexie had a ball. 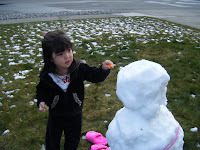 Now that the sun is out I'm glad we did it then since it looks like the snow will be gone before the sun sets. 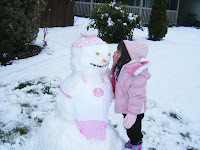 As you can see, Lexie insisted on kissing Princess SnowLady good-bye before we went in. 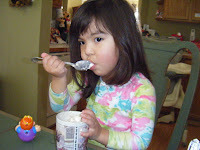 We came in to warm up with some hot coco & whipped cream (Lexie's favorite part) and she went right down for her nap. 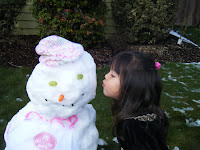 I just hope Princess SnowLady is still there when Lexie wakes up as it's really melting fast. 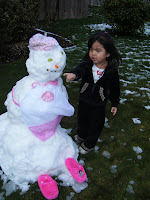 Well I'm afraid things didn't go well for the Princess and I'm talking about SnowLady not Princess Lexie Lou (which is how she introduces herself to everyone right now.) We went back outside just 3 hours after we made her and her whole face had melted off, one of her slippers had blown away and her apron was down around her ankles, so to speak. 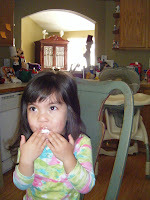 Lexie insisted on putting her back together as best we could and kissed her good-bye once again. I told her that tomorrow she will probably just be a pair of wet slippers and a dirty apron. 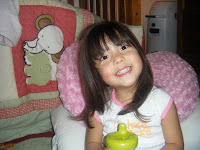 Tonight when I was tucking Lexie into bed she told me not to worry that Princess SnowLady will be fine. Who am I to argue with the all knowing Princess Lexie Lou?